Electrocorundum white is made in electric furnaces melting of pure alumina; it is more uniform, than normal. Main properties of white electrocorundum: high microhardness, high density. Thanks to the characteristics, electrocorundum white is applied to processing of high-strength alloys, at high-speed and precision grinding. Abrasive products from white electrocorundum differ in stable properties, possess a good samozatachivayemost and provide high purity of the processed surface. White electrocorundum 24A F4 (reginerat) 4750 - 5600/3350 - 8000 GOST 52381 available in a warehouse, we carry out delivery across the Republic of Kazakhstan and the CIS countries. White electrocorundum 24A F4 (reginerat) 4750 - 5600/3350 - 8000 GOST 52381 to you will be prompted by our manager. 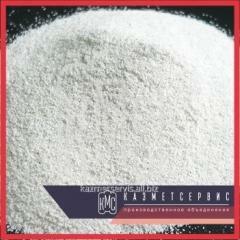 Unbelievable price on White electrocorundum 24A F4 (reginerat) 4750 - 5600/3350 - 8000 GOST 52381 in Almaty (Kazakhstan) company PO KazMetServis, TOO.